Below are my Top Droppers for July. Thanks everyone for dropping on me. I was lacking on the dropping for awhile. But now am back into it. I feel more into it now that Entrecard seems back on track. I even noticed more people buying ads on my site since the changes. Did you notice that? 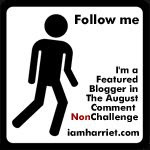 Also Harriet is having a "featured blog" a day challenge this month. Click this to find out more. I signed up to be featured and you can too. i think the raise in our advertising price is also connected with the end of the CashOut-program. Many members have "saved" their credits for CashOut but in the end, EntreCard didn't buy these credits back. So i sit now on 100.000 Credits. If i would pum these into the Economy many ad prices from the smaller blogs would get unnecessary inflated and Entrecard takes between 50 and 75% as advertisement tax. I had a better idea, i want to manage the 1 Million EC Free Traffic Contest and top it with cash prizes above 100$ (1.000$ is also a nice number, guess really too much for now). To reach this goals i offer each sponsor, free traffic from the participants to their websites during the give-away of their weekly prizes. You sponsor 5.000 EC (or 5$/ad space what ever has a value for the bloggers) or more and get one week exposure on one of my four blogs (while on the other blogs someone else gets their exposure for a week or a day). The participants want to win the 5.000 EC, cash or ad space or whatever, so they have to visit the sponsor and read one of their posts. I think this is a complete different contest, fun, exciting and NEW! Never get so cheap advertisement for one week where you get guaranteed visitors. If you want to take part as sponsor, the deadline is 31st of August. The earlier, the better because you get already now link love and we can organize the dates and the prizes already. YES, i want free traffic i sponsor like many others did already. Have a good start in your week and congratulations to your TOP Droppers! Thank you for the link! I enjoy visiting your blog. I, too, have noticed that ad prices have gone up and the number of people interested in advertising on my blog has gone up since the announcement of no more paid ads. hi just wanted to say, i love the layout and theme :) simple but really pretty! Congrats to you. I don't keep track my self. 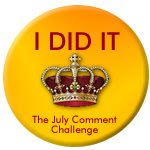 But I do have a top commenters widget on my blog. so I know who comments the most. Hi, i'm a newbie blogger. I just joined Entrecard and found your blog. I think you got nice post. I also would like to congratulate the top droppers. And i also hope to be one of them in the near future. Cheers!! !